On this page you'll find the answers to questions that we are often asked about our kittens. If you still have questions after visiting our site, feel free to contact us. Will We Have Kittens Available Soon? Our queens usually only have a single litter per year to ensure that they stay in top condition and our kittens receive plenty of love and attention. As such, we cannot guarantee availability of kittens until a litter is born. We won't know how many kittens we have until the day of their birth! We do however keep a waitlist and will contact everyone on the waitlist after kittens are born. You will find plans for our next litters on our Kittens page. What colours do Siberians come in? Please see our Colours Page. What Will My Kitten Look Like When Grown Up? Your kitten will take traits from both parents. The best way to get an idea of what your kitten might look like is by looking at their parents. You can see pictures of all of our breeding cats in their own slideshows via the links on the Our Cats page; each cat has pictures from when they were a baby right up until now. You will see all the stages of growth they go through and how they look as an adult. Keep in mind that it takes up to 5 years for a Siberian to fully mature and many of our parents won't have reached that age yet, so they will look even more regal in a few more years! How Are Our Siberian Kittens Raised? 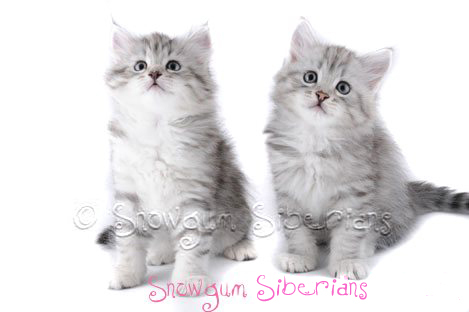 Snowgum is not a large commercial cattery, breeding and showing our beautiful Siberian kittens is our family hobby. Litters are born in our study. They move to our dedicated kitten nursery room for weaning and toilet training. Mother and kittens stay there to develop their skills until the kittens are old enough to explore the wider house. At around 6 weeks kittens are health checked by our vet check. They are vaccinated twice, spayed/neutered and microchipped before going to their new homes between 10-13 weeks. Our kittens receive the best food available and lots of love, attention and handling. This ensures their good health and friendly temperaments. Our children are involved in the raising of the kittens and start interacting with the babies from birth. 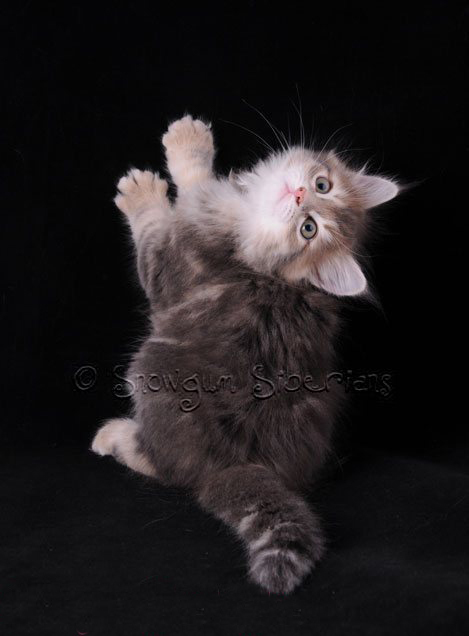 What Vaccinations Do Our Siberian Kittens Receive? Vaccines are often divided into "core vaccines" and "non-core vaccines". The core vaccines could be considered essential for all cats, whereas the non-core vaccines are given dependent on the individual cat's requirement for them. Your kitten will be vaccinated against the core feline diseases: Feline Panleucopenia (also called Feline distemper or Feline Infectious Enteritis) and Cat Flu (also called Feline viral rhinotracheitis, caused by Feline calicivirus and herpesvirus). We leave it up to the new owners to decide whether they want to vaccinate against non-core illnesses. There have been side-effects associated with some non-core vaccinations (and even with the continued use of core vaccines) so you should make this decision based on your kittens lifestyle (inside/ outside/ in contact with other cats/ travel etc) and in consultation with your vet. With regards to ongoing annual vaccinations, we only recommend this if you are showing your cat or are taking it to a kennel when you go on holidays (and this is only because evidence of annual vaccination is required to be accepted into shows and kennels). If you are not in these situations, we do not recommend ongoing annual vaccination as these put a huge stress the immune system and can actually induce illness including seemingly unrelated illness like Irritable Bowel Disease and heart problems while providing little extra benefit to the immunity of the animal. Our UK vet recommended one booster vaccination at age 15 months and then nothing further for the remaining life of the animal. US vets commonly use a 3 year schedule now. If you and your vet prefer to continue with vaccinations, we recommend that you do this once every 3 years like the US protocol rather than every year and under no circumstance should you administer a vaccine if the cat is not in peak condition. It is worth noting that there is now quick test called Vaccicheck that can be done at your vet to check whether a dog's vaccines are still providing protection. This is done by measuring antibody levels. The equivalent test for cats will be coming to Australia soon, so you will then be able to test your cat to see whether they require a booster vaccine. What Do We Feed Our Siberian Kittens? Here at Snowgum we understand that good health begins with a good diet. Our cats and kittens are raised on super premium diet of Royal Canin dry food, cooked chicken and fish and tinned foods such as Ultimates and ZiwiPeak. We provide a diet sheet and food samples with our kittens so that you know exactly what they are used to eating. We also provide a large amount of information on the benefits of a low carbohydrate diet, how to feed such a diet and the suppliers we use to source the best foods for our kitties. Can Our Siberian Kittens Go Outdoors? People often ask us if Siberians are best as indoor or outdoor cats. We do not require that your kitten is kept indoors but you should carefully assess your area before you decide what sort of access you give them to the outdoors. 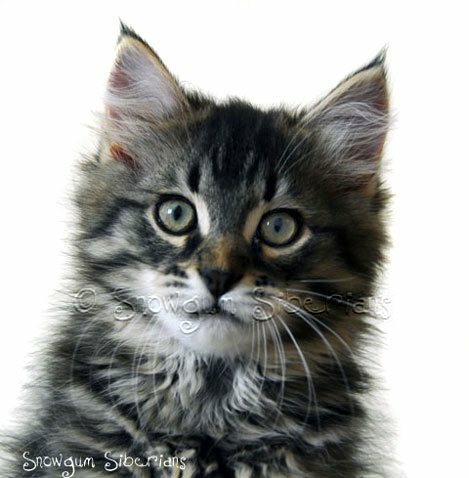 Siberian cats are great hunters and love to explore the great outdoors, feel the wind in their fur an chase the bugs, however, the road can be a very dangerous place and ticks can be dangerous too. We believe that as new owners, you will know your area better than us and will know whether it is safe for your kitten. In our experience, as Siberians are very social cats, a single kitten left inside all day can get very lonely and bored. If you are going to keep your kitten as an indoor cat, it is best to get two kittens so that they can keep each other company and play together. A single kitten will be less bored if it has access to the outdoors. Many of our kitten owners don't like to let them roam so a secure outdoor enclosure, a secured garden or a balcony enclosed with clear cat mesh can be a nice compromise for your kitty. We hope that our kittens will get some access to the outdoors as they do love the fresh air and enjoy watching the birds. Do Siberians Get On Well With Dogs? 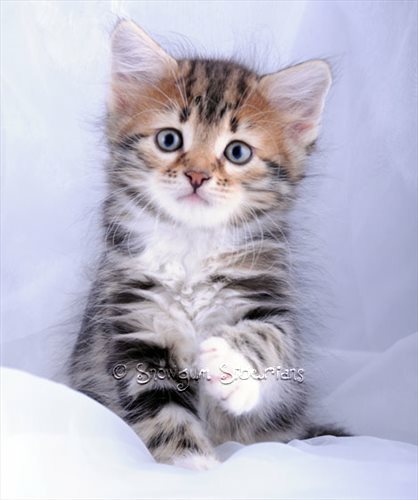 We do not have a dog so your kitten will not be raised with dogs however, Siberians are very social and kittens will adapt well to life with a dog provided the dog is friendly towards it. Many Snowgum Siberians live happily with their canine friends. Low allergen is not to be confused with low shedding! Siberians have two main moults a year; one in Spring to drop their heavy winter coat so they are comfortable in the hot summer weather, and again in autumn to shed out any burrs in their coat to ensure their glorious winter coat can grow through freely. 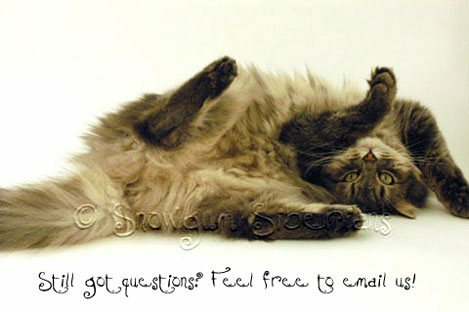 Are Siberian Cats Too Hot In Australian Temperatures? Siberia has one of the world's greatest temperature variations with average winter temperatures around -20°C, and summer temperatures frequently reaching 30°C and even +38 °C in some parts. Siberian cats are well adapted to these temperature changes; they will drop their thick, heavy coats in Spring leaving a shorter coat with much less undercoat. They regrow their thick coats and fabulous ruff around their neck in the autumn so they can keep warm in winter. They are thus well adapted to our temperatures here in Australia. How Much Grooming Do Siberian Cats Require? Most Siberian's coats are generally fairly easy care and require much less attention than a Persian cat. Grooming requirements do however vary quite a bit depending on the cat and the time of year. Most will be fine with a comb once a week, some with thicker undercoats require a daily comb to keep them looking their best. During their moulting periods in spring and autumn they will require more frequent grooming than at other times of the year. Grooming is a great way to bond with your cat; it replicates the mother's grooming sessions with them as a kitten and if done regularly from kittenhood, most cats love their grooming sessions. One Siberian Kitten or Two? Siberians are very social cats and they love to play, even when they grow up! It is nice for them to have a play mate, whether that is yourself, your children, your dog or another cat. We like to see kittens go to their new home together as it makes settling in less stressful and they will have a friend for life. We don't recommend getting just one kitten unless you are going to be home during the day to give it plenty of attention, or they are going to be given some access to the outdoors. 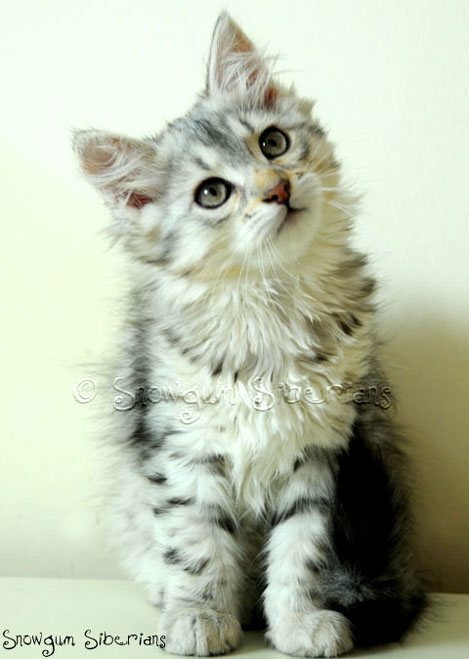 Can We Ship Our Siberian Kitten? Yes, we can ship kittens, but the relevant costs are additional and will add to the overall cost of your kitten. These costs are your responsibility. All shipping expenses including airport drop off, airline approved travel cage and flight costs are paid direct to the shipping company. We will organise the booking for your preferred date, you just need to call the shipping company to pay and then pick up your kitten at your chosen airport. The full payment for the kitten must reach our account a few days before the kitten will be shipped. Estimated shipping costs for common destinations are listed here. 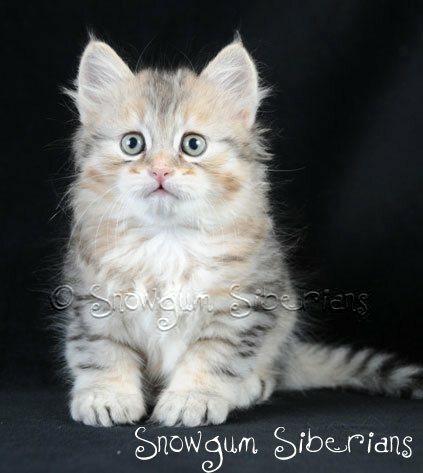 How Can I Reserve a Siberian Kitten? Please see our "How to Adopt" page for details of the adoption process. Can I Have an Allergy Test? Please see our "Allergies" page. Can I Have A Kitten On A Trial Basis? Definitely not. Our kittens are not toys, they are living creatures that we have brought into the world, raised, cared for and loved. We are looking for secure, permanent, loving homes to ensure our kittens have the happiest lives possible. Can I Meet You Before Deciding Whether To Adopt? Absolutely. We would love to meet you at a cat show where you can see the cats we have on show and chat about all things Siberian. Please email and ask when we will next be attending a show. We are located in East Killara on Sydney's Upper North Shore, 20 minutes via train from the CBD and then a 20 minute walk from our closest train station. There is parking on our street if you wish to drive.